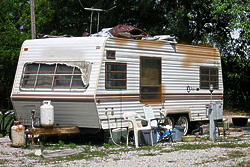 Our adjuster’s assignment was to get a signed statement from a witness who lived in a trailer park in one of the more economically challenged areas of Los Angeles. Upon arrival at the address, she was confronted with a dilapidated, rundown old trailer that had definitely seen better days. There was a large “No Trespassing” sign in the yard, and in one of the broken windows was another sign that read “insured by Smith & Wesson” over a picture of a rather menacing looking handgun. Undeterred, our adjuster walked up to the door of the trailer, positive but on guard. The door dangled nearly off its hinges and the front “steps” consisted of a couple of old milk crates placed at such a precarious position to one another that they almost guaranteed a slip and fall. Carefully balancing on the crates in heels, the adjuster knocked on the door and was invited in by the witness. Glancing around the inside of the trailer, the adjuster noticed a gaping 15-inch hole in the floor which provided a clear view through to the dirt below. A few plastic chairs scattered haphazardly around the small space appeared to be liberally covered with greasy stains. Tactfully declining an invitation to sit down, the adjuster was able to get a complete statement and had the witness sign it, all the while trying not to touch anything inside the trailer which seemed to be uniformly covered with a layer of grime. Finishing her assignment, she beat a hasty retreat back to her car and the arms of civilization. Based on the witness’s version of the incident in question, the insurance carrier was able to successfully deny the claim.